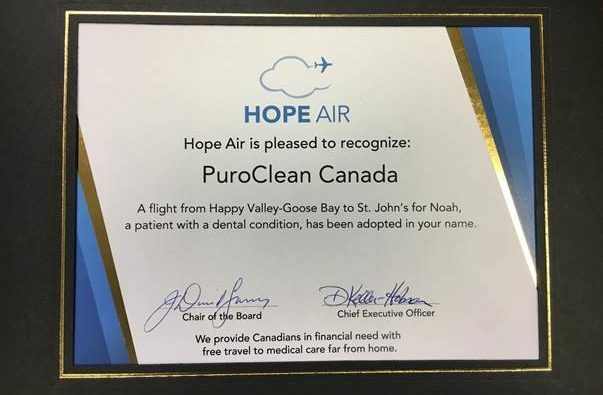 In appreciation for supporting this worthwhile cause, PuroClean was awarded a special certificate of recognition from Hope Air. According to their website, Hope Air has provided 11,677 flights over the past 12 months; that’s about 973 life-saving trips per month, or more than 226 per week. Since 1986, they have completed a generous 133,343 flights for patients that were financially unable to make the trip, including many for whom taking a car or bus was simply not possible. The company estimates that for more than approximately 20% of the population of Canada who live in rural areas and small communities that do not have local access to specialized medical care, the closest specialist may be more than 16 hours away by car or bus. Long distances, low incomes, physical discomfort, time constraints and overnight logistics all provide challenges that Hope Air is rising to meet. Many patients may feel like it is necessary to cancel or postpone medical care in light of all of these challenges. The staff and volunteers are consistently caring, friendly and supportive for their flight recipients. PuroClean is honored to support Hope Air in their mission. Find out more about their good work at HopeAir.ca.